Four of Europe’s top five leagues ended very much as expected, with the teams with the highest valued players claiming the top prizes, whilst those with less financial muscle often struggled to survive. The Premier League bucked this trend, partly thanks to the greater financial strength from television deals which saw smaller, unfashionable clubs able to attract big name players from some of the major European leagues. Whilst the wealthiest Premier League clubs still had the pick of the top players, there were still plenty of rich pickings for other Premier League clubs making it by far the most competitive of the top European leagues. In this month’s newsletter SportsMatrix looked at every club in the English Premier League, Spain’s La Liga, Germany’s Bundesliga, Italy’s Serie A and France’s Ligue 1 to see how team’s performed according to the value of their playing squads and their percentage success rate. Establishing the market value of each squad is subjective with players’ values sometimes fluctuating wildly during the season based on performances. For the purpose of this report the value of each playing squad was calculated based on the figures appearing on the site Transfermarkt in May 2016. For each league we took percentage success during the season for all teams and correlated that with the market value of the clubs. The higher the percentage the closer the relationship between success and market value, whilst the lower the percentage the weaker the correlation between success and market value. The Premier League clearly stands out as the league where correlation between success and market value was weakest during the 2015-16 season. This largely as a result of Leicester City’s remarkable rise; excellent seasons for Southampton and especially West Ham, combined with Chelsea’s collapse. It is interesting to note that if Chelsea had finished top and Leicester City 10th with the same number of points, then the Premier League’s correlation would have been 80.5%, close to that of France’s Ligue 1. 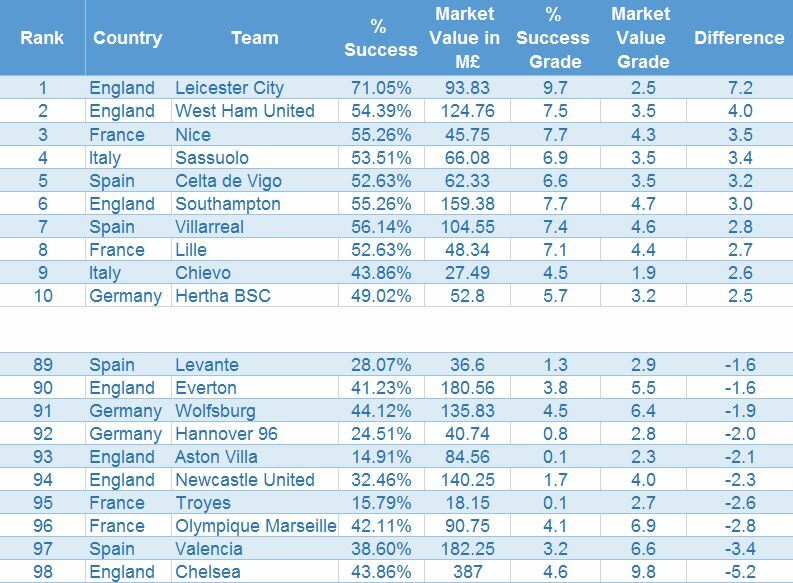 The correlation between success and market value was strongest in the Bundesliga, La Liga and especially Serie A, with the teams at the top of each of these leagues having by far the highest market values and with relatively few teams in these leagues bucking the trend. In Ligue 1 the correlation between success and market value was somewhat less pronounced. Although the top three teams had the highest market values; most of the teams from fourth place Nice down to 10th place Bastia considerably overachieved. We needed a method to show whether high market value really was a predictor of success. But comparing market value of a Premier League club with that of a club from another league would not be a logical comparison. For example Leicester City were ranked 13th in market value in the Premier League, but their value in Ligue 1 would see them ranked fourth, in Serie A and La Liga eighth and in the Bundesliga ninth. So to establish a more accurate measure of success against market value, we took the success rate and market value of each team and calculated how far they were from the average in their league. This difference in performance provided the percentage success rate, whilst the difference in market value gave the market value grade. Normal distribution calculation provided the team’s percentage success grade. This was done by taking the normal distribution of a team’s percentage success, the average percentage for the league and the standard deviation. The range of values being between 1 and 10. Market value grade was achieved using the normal distribution calculation; taking a team’s market value, the average market value for the league and the standard deviation. The range of values being between 1 and 10. The difference between the percentage success grade and market value grade gave the team’s overall grading. We then combined all 98 clubs from the top five European leagues, giving us a league table revealing the top and bottom 10 performing teams, based on season’s success against their market value. Correlation of wealth to success was strongest in Serie A and was reflected in the performance of the individual Italian clubs, who generally performed close to expectations. The two clubs to perform considerably better than their market value would suggest were Chievo and especially Sassuolo, with a number of Italian teams underperforming, especially Sampdoria and Lazio, but with none appearing in the bottom 10 of underperforming teams in Europe. The top and bottom 10 clearly highlighted the unpredictability of the Premier League during the season, with three overachieving Premier League clubs featuring in the top 10, whilst four underachieving clubs featuring in the bottom 10. Leicester City were by far the top overperforming team, with West Ham United and Southampton ranked second and sixth best respectively. At the other end of the table Chelsea had the ignominy of being ranked as by far the biggest underachievers of all 98 clubs in Europe’s top five leagues. Paris Saint-Germain ran away with the Ligue 1 title, performing exactly as expected for a team valued so highly; however the team to most overachieve in France were Nice who were ranked third out of 98 clubs in Europe. Lille were ranked eighth, whilst Caen with the sixth lowest market value in France, finished just outside the top 10. Whilst Nice had an outstanding season, their Mediterranean neighbours Olympique Marseille were France’s biggest failures, finishing 96th out of 98 clubs, making them the third biggest underachievers in Europe. Correlation of market value to success was strong in the Bundesliga, with Hertha Berlin the only German team to feature in the top 10, with Mainz 05 one place lower. Featuring in the bottom 10 were Hannover 96 ranked 92nd, whilst one place higher were Wolfsburg, were ranked fifth in market value in the Bundesliga. There was a fairly strong correlation between market value and success in La Liga, with two Spanish teams appearing in the top 10 and two in the bottom 10 for their performances during the season. It was a season of massive underachievement for Valencia’s two La Liga teams, with Levante finishing bottom of La Liga and ranked as the 10th biggest underachievers. Their far wealthier neighbours Valencia, boasting the fourth highest market value in La Liga, ended the season in 97th place, the second worst underperforming club in Europe’s top five leagues. Villarreal located an hour north of Valencia were the seventh best team in Europe based on market value and performance; whilst ranked as the fifth most overachieving club in Europe were Celta de Vigo. Boosted by the promise of a huge injection of cash in the 2016-17 season, many Premier League clubs found themselves in a position where they were able to attractive top quality players from other leagues. But in a season like no other before it, Leicester City finished top of the league and Chelsea half way down, making Leicester City the most overachieving team in Europe’s top five leagues based on market value and Chelsea the biggest underachievers. West Ham United finished in seventh place and 10th in market value, meaning that they were the second best performing team in the Premier League after Leicester City and slightly better than Southampton who finished with one point more, but whose market value was higher. At the bottom of the league Aston Villa and Newcastle United performed worse than all teams with the exception of Chelsea, with both teams relegated. Honourable mentions go to Stoke City, Swansea City and Tottenham Hotspur who all overachieved during the season, whilst Everton, Manchester City and Liverpool all underachieved based on their market values. With their massive television deals giving them a huge advantage over all other La Liga teams, Barcelona and Real Madrid were ranked close to average in terms of success compared to their market value, neither achieving nor underachieving. Atletico Madrid, although ranked third in value, were valued at close to half of that of the two giants; despite this, their percentage success grade was very similar to that of Barcelona and Real Madrid, making them the fourth most overachieving club in La Liga. Ranked 9th in market value (£62.33 million) Celta de Vigo ended the season in 6th place, making them the La Liga team which overachieved most, slightly better than that of Villarreal, who finished a couple of places and four points better off, but whose market value of £104.55 million was significantly higher. Special mention for Las Palmas who finished in 11th place, despite being the lowest valued team in La Liga by some margin. The team to most underperform in La Liga were Valencia who despite having the fourth highest market value they ended the season in a lowly 12th place. Of the top five leagues in Europe, Serie A saw fewer extremes in performance compared with market value. The top three clubs all performed close to what was expected; but the team which continued to push well above its weight in only its fourth season in Serie A was Sassuolo. The Modena based team finished sixth, with their market value of £66.08 million making them the ninth most valuable team in the league, but the one which overachieved more than any other. Whilst city neighbours Hellas Verona finished bottom of the league, Chievo finished in a respectable ninth place. Chievo’s market value was marginally lower than that of Hellas Verona, making them the second most successful team in the league, whilst their neighbours ended the season suffering relegation to Serie B.
Whilst Roma slightly overachieved during the season, rivals Lazio with the sixth highest market value in Serie A, finished eighth. The team to most underachieve during the season was Sampdoria who finished 15th and had the eight highest market value in Serie A.
France’s top three teams in position were the top three in market value; whilst the teams from fourth down to 10th all overachieved, with the exception of eighth placed Rennes, who performed close to what was expected based on their market value. The most impressive performance in Ligue 1 came from Nice, who finished fourth, only two points behind Monaco despite having the ninth highest market value. Lille finished one place and three points behind Nice, but were valued slightly higher than Nice; whilst Caen finished seventh, despite the sixth lowest market value. Honourable mentions go to sixth placed Saint-Étienne, ninth placed Angers and 10th placed Bastia, all of whom performed better than expected based on market value, especially Bastia who had the second lowest market value in the league. Olympique Marseille’s 13th place finish, coupled with the fourth highest market value in the league, saw them ranked as the most underperforming club in Ligue 1, slightly worse than Troyes who ended the season rock bottom of the league. Other teams to underperform were 17th placed Toulouse and 18th placed Reims, with the latter relegated on the final day of the league season. As with Serie A, the teams from the Bundesliga mostly ended the season in positions reflecting their market values; with a few notable exceptions. The two teams to overachieve were sixth placed Mainz 05 and seventh placed Hertha Berlin who finished the season on equal points and with both teams having almost identical market values and ranked 10th and 11th in market value amongst the 18 Bundesliga clubs. Köln, Ingolstadt, Borussia Monchengladbach, Bayer Leverkusen and Darmstadt 98 all performed slightly better than expected based on their market values, with Borussia Dortmund and Hamburg also performing slightly better than expected. Hannover 96 with the third lowest market value finished adrift at the bottom of the league; although arguably eight placed Wolfsburg, with the fifth highest market value in the league were the biggest underachievers. Stuttgart, who flirted with the drop in recent seasons, ended their stay in the Bundesliga, with a 17th place, despite having the eight highest market value in the league. Other teams to underperform based on their market values were Hoffenheim and Eintracht Frankfurt.